Step under the stately portico,up the foyer stairs and into the halls of the 1921 Onancock School to find a hive of artistic endeavors behind the doors of old classrooms of yesteryear. Our resident tenants include uber-talented artists, painting in many mediums, several potters and carvers, jewelry designers, a landscape architect, and writers. Most of the artist studios are working studios, so it's always a good thing to connect first to be sure they are available. Learn all about our residents. Marge Bradach is a painter and jewelry maker here on the Eastern Shore since moving to Gargatha in 2006. Well known for her highly evocative paintings in oil, acrylic, and watercolor, she has been juried into shows in Salisbury as well as Ocean City and Worchester County. Her prize winning paintings capture life on the Eastern Shore of Virginia in all its forms, colors, and richness, Marge does commissioned pet portraiture from your favorite photo. She has studios in Onancock and in Chincoteague. Marge Is a painter and jewelry maker here on the Eastern Shore since moving to Gargatha in 2006. 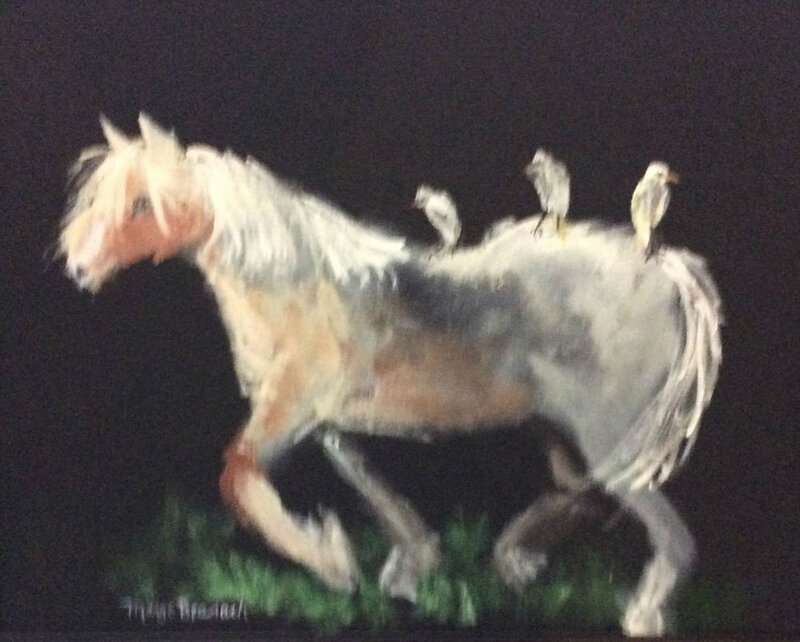 Well known for her highly evocative paintings in oil, acrylic, and watercolor, she has been juried into shows in Salisbury as well as Ocean City and Worchester County. Her prize winning paintings capture life on the Eastern Shore of Virginia in all its forms, colors, and richness, Marge does commissioned pet portraiture from your favorite photo. She has studios in Onancock and in Chincoteague. Billy Crockett, Master Carver, has been an avid nature lover all of his life and brings that love and respect to life from a simple block of wood. His studio is a wonder of birds and wildlife of every size and description. Drop in his studio, where he can be found most every day - except when he is out on the water or beach gathering new ideas and artifacts for his next creations! Willie Crockett’s paintings are recognized as being among the most honest portrayals of Chesapeake Bay drama and beauty. Best known for his wildlife art, Willie transmits to his painting an ever fresh view of the Eastern Shore landscape, the wildfowl and the marsh. An occasional easy transition into colorful abstracts and flowers speaks for the versatility of the painter and the sensitivity of the man. While best known for his glowing watercolors, Crockett works in oils and acrylics as well. April Flory attended the High School of Art and Design in Manhattan, where she majored in Package Design and Illustration, and the Rhode Island School of Design where she earned a BFA in Textile Design. She has had a long career as a designer of textiles, china and jewelry, including twenty years as a staff designer at Tiffany & Co. She recently began exploring making pottery and printing fabric. April uses watercolor and oils to paint outdoors. The gouache style she developed as a product designer strongly influences her plein air painting, lending it a distinctly decorative and graphic point of view. She lives in Onancock, Virginia with her husband, sculptor Bruce Ricci. Laura McGowan is an oil painter living and working on the Eastern Shore of Virginia. She has been interested in various artistic pursuits since her childhood in New Jersey, when she began experimenting with watercolors and pastels. She earned a Bachelor of Fine Arts degree from Pratt Institute, and her first career was in interior and graphic design, in New York and London. In 1994, Laura moved to Onancock, Virginia. Following a career as an art teacher, Laura is now a full-time artist. Becky spent her career working for the Federal government on natural resource management (whales and tuna) and appreciating and collecting art in her spare time. Now she focuses on capturing the beauty of the Eastern Shore. She loves painting the landscapes of fields and marshes and trying to convey the majesty of the animals that populate this “foggy place”.